NTFS Reader for DOS is a free utility that creates a DOS boot floppy that can read NTFS formatted drives. This is something that you could use if you were unable to start Windows, not even in Safe mode, and you don't have access to, or don't care to deal with the Windows Recovery Console. In this type of crash situation, this might allow you to recover your data from an NTFS formatted drive. • Your computer must have a working floppy drive installed, and the BIOS must be configured with the floppy as the first device in the boot order. 2. Insert a blank formatted floppy disk in the drive and double-click on the downloaded file's name. 3. In the dialog box that appears, click on the [Start] button. The NTFS Reader utility will write some DOS files to the floppy disk, including COMMAND.COM, AUTOEXEC.BAT, and READNTFS.EXE. 4. In the dialog box, click on the [Close] button. 5. With the floppy disk in the drive, restart the computer. 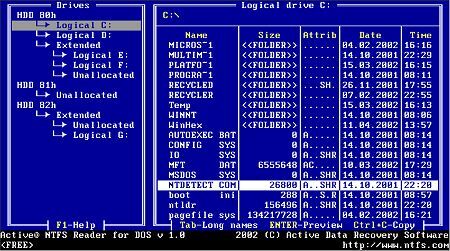 NTFS Reader for DOS works similar to the old DOS file managers. Use the [Tab], [Shift] + [Tab], and Arrow keys to navigate. It allows you to get a directory / file listing of an NTFS formatted drive (in DOS 8 + 3 character file name format) and copy files from the NTFS drive to a FAT formatted drive. This free utility could be a life saver in a crash situation where you need to recover your data from NTFS formatted drive. If the NTFS drive is in such bad shape that you can read it with NTFS Reader for DOS, visit the ntfs.com web site for more information about data recovery, including how to fix a damaged Master Boot Record.